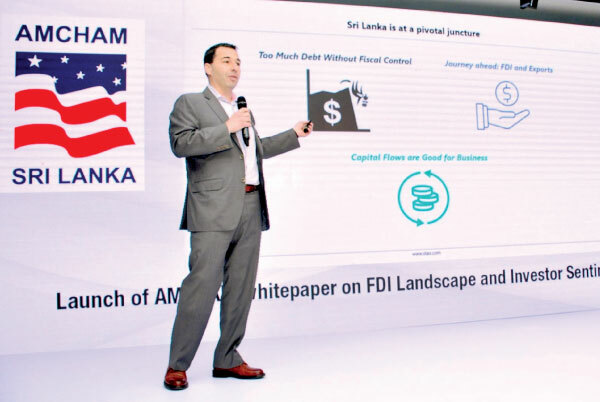 AMCHAM, in collaboration with STAX, recently launched the 2018 whitepaper ‘FDI Landscape and Investor Sentiment in Sri Lanka’ at a gathering of business and government leaders including the Minister of Development Strategies and International Trade, Malik Samarawickrama. In addition to providing a definitive view of FDI statistics, the whitepaper interweaves expert insights from regulatory authorities to provide ten actionable recommendations for government stakeholders to enact. Clarity and consistency of data: Currently, there are multiple sources of FDI data, that is confusing to the international investor community. We recommend that the Central Bank, BOI, and other relevant agencies coalesce together and have one consistent reporting methodology on FDI. Digitize data collection: At present, most FDI data is gathered via an island-wide paper survey. The need of the hour is to digitize the process of data capture to better enable the widest penetration of the survey and streamline subsequent analysis. Ensure a representative sample: While sectors like manufacturing are traditionally well-represented in FDI surveys, the picture is incomplete. To develop a fuller view of Sri Lanka’s FDI position, there is a need to capture data on FDI inflows entering under-represented sectors like Technology/KPO/BPO. In these sectors, most of the repatriable profits are reinvested into business expansion activities. Develop one umbrella organization for FDI: Instead of having numerous line ministries with overlapping mandates for reaching out to global investors, there needs to be one central body capable of formulating policy, issuing guidelines, attracting investors and governing FDI flows. Ensure long-term policy stability: About 59% of respondents surveyed in this report cited policy instability as a key barrier to conducting business. Changes in tax policy such as VAT rates, import duties and sudden shifts in economic strategy have all contributed to sending negative signals to prospective investors. Sustained policy stability is the need of the hour to provide a sense of clarity. Negotiate favorable and clearly defined trade policies: Developing exports through Free Trade Agreements (FTAs) and bolstering Sri Lanka’s position as a country with preferential access to markets like China, India and Europe, will be the cornerstone of establishing Sri Lanka’s attractiveness as an FDI destination. Define and articulate Sri Lanka’s clear value proposition, across industries and capabilities: To attract FDI in a competitive global market, Sri Lanka needs to develop and communicate a clear and consistent value proposition to investors. Whether this value proposition relates to Sri Lanka’s strategic geo-political position or its access to talent, it is important that stakeholders reach a consensus and articulate the value proposition across industries and capabilities. Improve transparency and corporate governance: Standards in areas such as corporate governance, government procurement, and transparency must be elevated in line with international practice. Develop financial incentives to bring in capital across industries: Innovative financial incentives and grants are needed to further stimulate FDI across both capital-intensive and services-based industries. Invest in education and vocational training to match industry needs and potential and improve productivity: At least 63% of respondents surveyed cited a shortage of quality labor. However, the problem isn’t necessarily a human resource shortage as it is a failure to fully develop the workforce and improve productivity of the existing labor force. STAX, Sri Lanka’s leading management consulting firm, has its headquarters in Boston, and branch offices across Chicago, New York, Colombo and Singapore. With a rich client base comprising 30+ local conglomerates and family businesses, 15 of the top 20 global investors and 25+ Fortune 500 companies.